Methanol is widely used in various industries directly or as a feedstock for the production of liquid fuels, chemicals, and plastics. Introduction of new regulations and policies to control emission of harmful gases has resulted in the increased demand for biofuels. This has also led to the research of the innovative methods that are energy-efficient, eco-friendly and low-cost. For instance, researchers at Tufts University have found a less expensive and efficient way of converting methane to methanol by using molecular oxygen and carbon monoxide. Similarly, more research projects are being carried on across the globe. Technology to use methanol as a substitute for diesel is also being commercialized in various countries. Political issues are also changing trade flows for methanol. With sanctions levied against Iran, the country has limited all the exports to Chinese and Indian markets. Hence, there is an ongoing development of new markets for methanol such as direct blending of methanol into gasoline, methanol to olefins, etc. 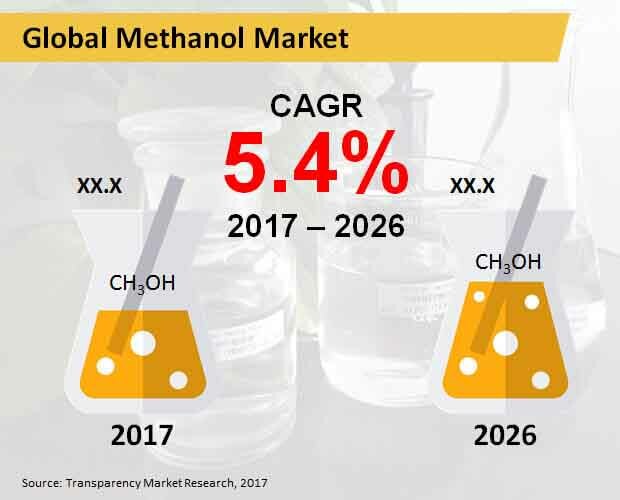 According to a new study by Transparency Market Research (TMR), the global market for methanol is likely to have a steady growth during 2017-2026. The market is anticipated to register CAGR of 5.4%. By 2026 end, the global market for methanol is estimated to bring in US$ 131,344.3 million revenue. Natural gas is estimated to account for over half of the revenue share by 2017 end. Natural gas is likely to gain market volume more than 77,700 KT by 2026 end. Natural gas is one of the primary feedstock for methanol. Regions such as the Middle East, Africa, North America and Latin America with access to low-cost natural gas are seeing an increase in methanol capacity. Cheap and unconventional supply of natural gas is leading towards the use of natural gas as feedstock for methanol. Formaldehyde is likely to account for the highest growth in terms of volume. By 2026 end, the formaldehyde is estimated to be account for market volume more than 37,200 KT. Formaldehyde is widely used in industries such as construction, furniture, textiles, automotive, paints and coatings, and pesticides and fertilizers. Formaldehyde is used in the production of amino resins. These resins made using formaldehyde have a phenomenal adhesive strength and moisture resistance. One of the biggest factor contributing to the growth of formaldehyde is its use in the fuel production as it is a cheaper substitute for oil. Asia Pacific Excluding Japan (APEJ) is likely to emerge as one of the biggest regions in the global market for methanol during 2017-2026. Methanol is being largely being used in China to produce olefins. The process is known as Methanol-to-Olefins (MTO). Meanwhile, coal gasification is one of the largely used production processes in order to manufacture methanol in China, with maximum plants in operation and more under the planning and construction. The government in China has also implemented fuel-blending standards and various programs to promote the use of methanol as a fuel. Meanwhile, in order to reduce pollution and fuel cost, India is also moving towards blending methanol with petrol. Some of the countries in Europe are also moving towards using gasoline blended with the small quantity of methanol. Meanwhile, other countries such as Israel and Australia have already completed commercialization activities in order to support methanol fuels. Celanese Corporation, Methanex Corporation, SABIC, BASF SE, Mitsui Chemicals, Inc., and Mitsubishi Chemical Holdings Corporation, are some of the key companies currently operating in the global market for methanol.